BRYAN EATON/Staff photo. 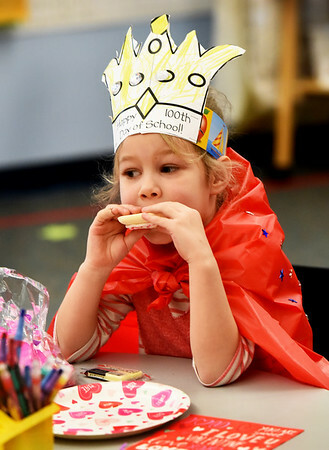 Autumn Shamano, 5, bites into cookie at a combination 100th day of school and Valentine Party in Jane Keeler's kindergarten class at Salisbury Elementary School. The youngster made capes like Zero the Hero wears with 100 stars or hearts decorated on eachg one.